Using traditional sculpting techniques, Jay Rotberg creates a timeless homage to the bonds between family. Using traditional sculpting techniques, Jay Rotberg creates a timeless homage to the tight-knit bonds of family. 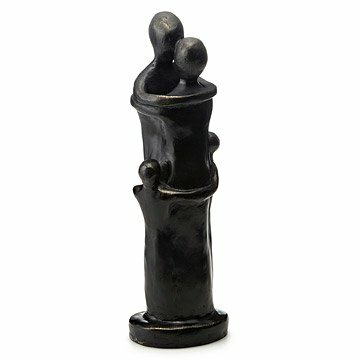 The artist's emotive pieces are originally sculpted out of wax then cast in bronze and then recast using bonded resins. He finishes each sculpture with a traditional verdigris patina, a technique used to preserve sculptures since antiquity. Featuring parents and two children in a tight embrace, this work of heart makes a powerful statement about the unconditional devotion we have to those we love. Handmade in the artist's studio in Greensboro, North Carolina. See Jay Rotberg's other sculptures A Mother's Touch and Wild About You. "I choose the abstract to nudge the viewer's imagination, to encourage them to bring their own reality of love to my sculptures," says Jay Rothberg. His work has found its way into shops, galleries, personal collections, and museums around the country. His varied life has ranged from work in institutions for the handicapped to teaching at Boston University and the University of Miami. Today, he designs his sculptures to emphasize vitality, movement, and love. My mother cried when she opened it. My mother first displayed this in the open plan kitchen, then later in the living room on the mantle and it was equally at home in both locations. It's beautiful and could not be more perfect for a close family. I purchased this for my son and daughter-in-law-it seemed to be the right choice as they have two children-like the statue. It was well received. Most excellent! Will definitely buy again! I gave it as a housewarming gift. Extremely well received! Excellent product. Very well done. This is a gift for my daughter. She is due anyday with her second boy. I haven't gifted yet, till she has the baby. I know the family will adore this fine art. I bought a "HUG" statue for my kids. It is perfect as they have 2 kids so the 2 hugging children around 2 hugging parents fit perfectly. It is a well made, wooden piece of sculpture that should last them a lifetime. It just couldn't have been a more appropriate gift.